Hyspaosines (209–124 BC), founder and king of Characene, had his capital in Charax. Charax Spasinu, also called Charax Spasinou, Charax Pasinu, Spasinu Charax (Ancient Greek: Σπασίνου Χάραξ), Alexandria (Greek: Ἀλεξάνδρεια) or Antiochia in Susiana (Greek: Ἀντιόχεια τῆς Σουσιανῆς), was an ancient port at the head of the Persian Gulf, and the capital of the ancient kingdom of Characene. The name Charax, probably from Greek Χάραξ, literally means "palisaded fort", and was applied to several fortified Seleucid towns. Charax was originally named Alexandria, after Alexander the Great, and was perhaps even personally founded by him. After destruction by floods, it was rebuilt by Antiochus IV (175-164 BC) and renamed Antiochia. It was at this time provided with a massive antiflood embankment almost 4½ km long by Antiochus's governor, Hyspaosines, and renamed "Charax of Hyspaosines." There is a theory that Charax derives from the Aramaic word Karkâ meaning 'castle', but Charax often attested at several other Seleucid towns with the meaning palisade. Charax was located on a large mound known as Jabal Khuyabir at Naysan near the confluence of the Eulaios/Karkheh and the Tigris Rivers as recorded by Pliny. "The town of Charax is situated in the innermost recess of the Persian Gulf, from which projects the country called Arabia Felix. It stands on an artificial elevation between the Tigris on the right and the Karún on the left, at the point where these two rivers unite, and the site measures two [Roman] miles [3 km] in breadth... It was originally at a distance of 1¼ miles [1.9 km] from the coast, and had a harbour of its own, but when Juba [Juba II, c. 50 BC—c. AD 24] published his work it was 50 miles [74 km] inland; its present distance from the coast is stated by Arab envoys and our own traders who have come from the place to be 120 miles [178 km]. There is no part of the world where earth carried down by rivers has encroached on the sea further or more rapidly..."
The Description of Pliny matches the depiction on the Peuintigener Table. The Jabal Khuyabir tell is now 1km south of the confluence of the Eulaios/Karkheh and the Tigris Rivers as the river shifted course during a well documented storm event in 1837. 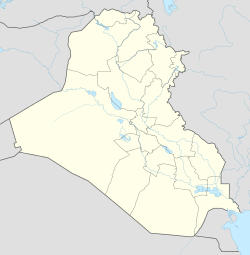 Naysān could be a colloquial Arabic corruption of Maysān, the name of the Characene region during the early Islamic era. First excavations and research started in 2016. Excavations on the site started in 2016, which revealed that the city was laid out on a grid pattern with housing block 185 by 85 m square. These belong to the largest blocks in the ancient world. Two large public buildings were detected, but are not yet excavated. A history of the Charax can be distilled primarily from ancient texts and numismatic sources, as the city has never been properly excavated. The city was established by Alexander the Great in 324, replacing a small Persian settlement, Durine. This was one of Alexander's last cities before his death in 323 BC. Here he established a quarter (dēmē) of the port called Pella, named after Alexander’s own town of birth, where he settled Macedonian veterans. The city passed to the Seleucid Empire after Alexander's death, until it was destroyed at some point by flooding. The city was rebuilt c. 166 BC by order of Antiochus VI Dionysus, who appointed Hyspaosines as satrap to oversee the work. The political instability that followed the Parthian conquest of most of the Seleucid Empire allowed Hyspaosines to establish an independent state, Characene, in 127 BC. He renamed the city after himself. Charax remained the capital of the small state for 282 years, with the numismatic evidence suggesting it was a multi-ethnic Hellenised city with extensive trading links. The Romans under Trajan annexed the city in AD 116. Characene independence was re-established 15 years later under the rule of Mithridates, a son of the Parthian King Pacoros, during the civil war for the Parthian throne. From this time the coinage from Charax indicates a more Parthian culture. In AD 221–222, an ethnic Persian, Ardašēr, who was satrap of Fars, led a revolt against the Parthians, establishing the Sasanian Empire. According to later Arab histories he defeated Characene forces, killed its last ruler, rebuilt the town and renamed it Astarābād-Ardašīr The area around Charax that had been the Characene state was thereon known by the Aramaic/Syriac name, Maysān, which was later adapted by the Arab conquerors. Charax continued, under the name Maysan, with Persian texts making various mention of governors through the fifth century and there is mention of a Nestorian Church here in the sixth century. The Charax mint appears to have continued through the Sassanid empire and into the Umayyad empire, minting coin as late as AD 715. Charax was finally abandoned during the 9th century because of persistent flooding and a dramatic decrease in trade with the west. The original Greek town was enlarged by an Arabian chieftain, Spasines, and afterward named Spasines and Charax Spasinou after him. It was a major trading center of late antiquity as evidenced by the hoards of Greek coins recovered during excavations there. Although it was nominally a vassal of the Seleucids and, later, the Arsacids, it seemed to have retained a considerable degree of autonomy at times. It became a centre for Arab trade, largely controlled by the Nabataeans, at least until they became assimilated by the Romans in AD 106. Prior to the invasion of Trajan Charax minted coins of a Hellenistic type while after the invasion the coinage was of a more Parthian character. Charax minted coin through the Sassanid empire and into the Umayyad Caliphate, minting coin as late as AD 715. It was visited in AD 97 by the Chinese envoy, Gan Ying 甘英, who referred to it as 干羅 (Pinyin: Gànluò; reconstructed ancient pronunciation *ka-ra), who was trying to reach the Roman Empire via Egypt but, after reaching the Persian Gulf was convinced to turn back by the Parthians. In AD 116, the Roman Emperor Trajan visited Charax Spasinu – his most recent, easternmost and shortest-lived possession. He saw the many ships setting sail for India, and wished he were younger, like Alexander had been, so that he could go there himself. Isidore of Charax, a 1st-century geographer, came from Charax Spasinu. Robert Eisenman contends that it was this city, and not the better-known Antioch in which Paul established his first church. ^ "JSONpedia - Charax Spasinu". jsonpedia.org. ^ Pliny the Elder (AD 77). Natural History. Book VI. xxxi. 138-140. Translation by W. H. S. Jones, Loeb Classical Library, London/Cambridge, Mass. (1961). ^ Vanessa M.A. Heyvaert, Jan Walstra, Peter Verkinderen, Henk J.T. Weerts, Bart Ooghe, The role of human interference on the channel shifting of the Karkheh Riverin the Lower Khuzestan plain (Mesopotamia, SW Iran), Quaternary International 251 (2012) 52. ^ Moon, Jane; Campbell, Stuart; Killick, Robert. "CHARAX SPASINOU 2016 ENGLISH REPORT". ^ O. Mørkholm, "A Greek coin hoard from Susiana", in Acta Archæologica, 1965, vol. 36, p. 127-156. ^ "Bibliography Page 37". www.parthia.com. ^ Isidore of Charax, The Parthian Stations. ^ Hill (2009), pp. 5, 23, 240-242. Casson, Lionel. 1989. The Periplus Maris Erythraei. (Translation by H. Frisk, 1927, with updates and improvements and detailed notes). Princeton, Princeton University Press. Hill, John E. (2009) Through the Jade Gate to Rome: A Study of the Silk Routes during the Later Han Dynasty, 1st to 2nd Centuries CE. John E. Hill. BookSurge, Charleston, South Carolina. ISBN 978-1-4392-2134-1. Nodelman, S. A. 1960. "A preliminary history of Characene." S. A. Nodelman. Berytus 13 (1960), pp. 83–123. Potts, D. J. 1988. "Arabia and the Kingdom of Characene." In: Araby the Blest: Studies in Arabian Archaeology. Edited by D. T. Potts. The Carsten Niebuhr Institute of Ancient Near Eastern Studies, University of Copenhagen. 1988. Museum Tusculanum Press, pp. 137–167. O. Mørkholm, "A Greek coin hoard from Susiana", in Acta Archæologica, 1965, vol. 36, p. 127-156. This page was last edited on 4 April 2019, at 23:07 (UTC).